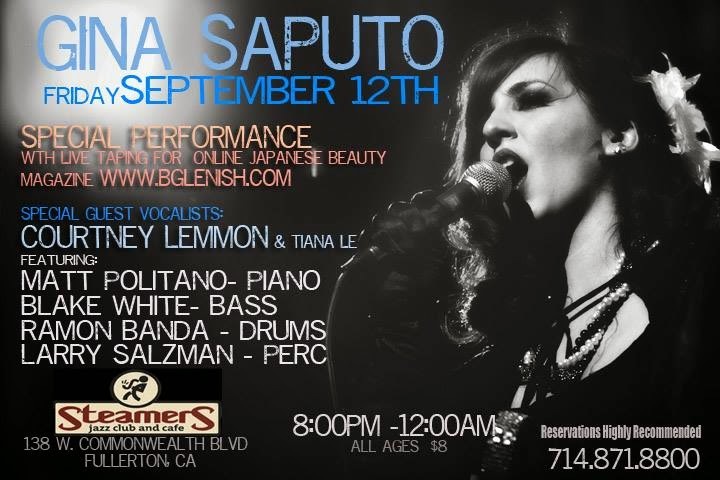 This next Friday, Sept 12th, don't miss Gina Saputo @ Steamers! Plus MATT POLITANO-BLAKE WHITE-RAMON BANDA-LARRY SALZMAN-COURTNEY LEMMON AND TIANA LE! Gina be doing a very special performance for a Japanese online beauty magazine called bglenish! "They will be following me all day and we'll rap up the shoot with an awesome of evening of music with my fabulous band and very special guest vocalists Courtney Lemmon and Tiana LE," she told us.